Units feature sanitary 304 stainless steel tubular frames with a #4 finish, stand-offs, and no penetrations. Electro-polished 316 stainless steel product contact surfaces. Sanitary air actuated diverter valve allows continuous bulk bag filling. System includes two (2) custom quick release discharge transitions with stainless steel butterfly valves. Stack lights indicate when bag is ready to fill, and when bag is full. Fill head includes inflatable spout seal, and bag inflation system. 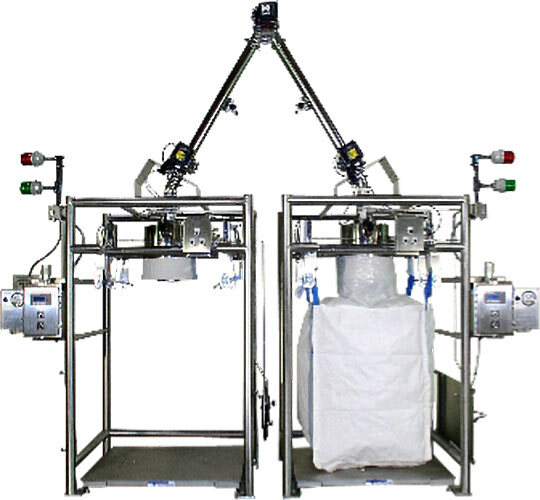 Pneumatically actuated bag strap release system for rapid bag removal. Designed for Class I & II, Division II, Group C, D, and G service. Mettler-Toledo scale system for accurate weighments.